Have you ever wondered what it would be like to have landed on Omaha Beach in Normandy on D-Day? Well, here’s your chance courtesy of good ol’ Bob Capa. 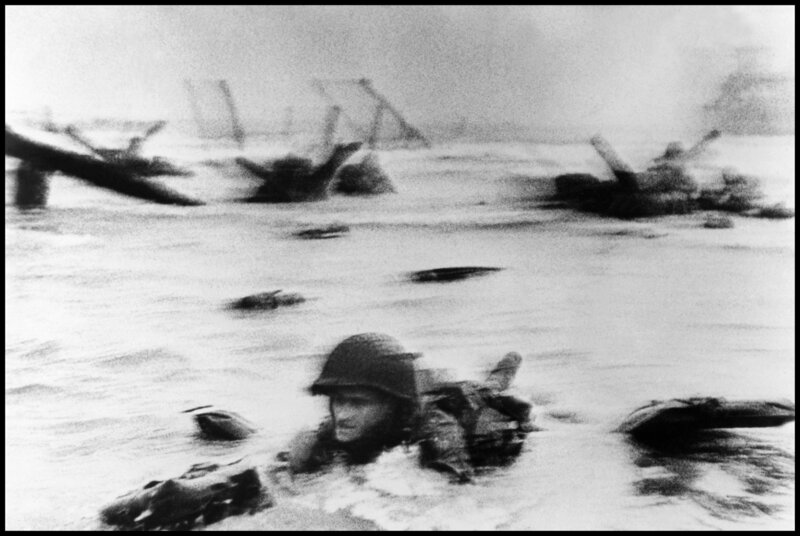 Robert Capa probably should have been committed to a psych ward for voluntarily going to Omaha Beach on D-Day. He was one of eighteen photographers allowed to cover the preparation for D-Day, and one of only four photographers allowed to actually land on the beaches of Normandy with American troops. Capa was 30 years old at the time. He “came ashore in the first wave at 0630 hours with E Company, 2nd Battalion, 16th Regiment, 1st Infantry Division” and should have died there, because nearly everyone who came in with the first wave did. He didn’t. Instead, he took some of the most moving photographs of one of the most important moments in the 20th century. These photographs are called the Magnificent Eleven, and this is one of them. The man in the foreground is believed to be Huston “Hu” S. Riley, Private First Class of the Section 2, Fox Company, 2nd Battalion, 16th Infantry Regiment. At 6:40 AM on June 6, 1944, the boat Riley was on hit a sandbar and they lowered the ramp. Riley jumped off and immediately sank under the weight of all of his equipment. He pulled his life jacket and floated to the top, bobbing like a duck ready for the Germans to shoot. He pulled off his life jacket, making himself less of a target, but it still took him about thirty minutes to get to shore. Apparently this wasn’t enough adversity for the young private, and he was shot twice in the neck, the bullets lodged in his back. This is when he was helped by a sergeant from the E Company, and a photographer. Riley was shook both by the bullets in his neck and the fact that there was a man with a press badge helping him on the God-forsaken beaches of Normandy. But as soon as Riley was safe, Capa took off to take more pictures. Capa spent all of 90 minutes on the beach on D-Day taking pictures. The Magnificent Eleven should have actually been the Magnificent One Hundred and Six but because of a horrifying mistake by some dumb, stressed out intern in the development room at the Life offices, we are left with only a glimpse of perhaps the most important battle of World War II.